Post-secondary programs subsidized and guaranteed by the French government: The French government subsidizes a very large share of the actual cost of higher education (€11,740 per student per year). No distinction is made between international students and French students: the admission requirements, the degrees awarded, and the attractive tuition rates are the same. Post-secondary degrees, based on the European structure of Bachelor, Master, and Doctorate, are regulated by the government, ensuring international recognition. Quality higher education, adapted to student's needs: France’s system of higher education comprises 3,500 public and private institutions. The system as a whole offers excellent programs at all levels and in every discipline. More than 900 programs are taught in English! A sophisticated research enterprise: France ranks sixth in the world in terms of domestic spending on research and development. The country’s National Center for Scientific Research (CNRS) is the world’s leading research organization (Nature Index, 2015). 12 of 55 Fields medals (the equivalent of the Nobel prize for mathematics) have been awarded to French nationals. 42% of the doctoral candidates in France are internationals. A world-class economic power: France has the world’s fifth-largest economy. Its gross domestic product ranks second in Europe, and the country is Europe’s second-largest market, with 65 million consumers (IMF 2014, Eurostat 2014). France is also the world’s fourth-largest exporter of services (OMC, 2013) and Europe’s leading destination for manufacturing investments (EY, 2014). Advanced industries and international corporations that are leaders in their field: France is home to 31 of the world’s 500 largest corporations (Fortune Global 500, 2014). Several French industrial groups are leaders in their sector and have operations all over the world: Airbus (aeronautics); Total, Areva (energy); Orange (telecommunications); Sanofi (health); LVMH (luxury goods); L’Oréal (cosmetics); Danone (food products). An environment favourable to innovation and to young entrepreneurs: France is home to more of the world’s top 100 most innovative companies than any other country in Europe (Thomson Reuters, 2014). It ranks sixth in the world in number of international patent applications (OMPI, 2013). 71 competitiveness clusters around the country form an appealing ecosystem of start-ups, laboratories, universities, and major corporations. French Tech, with €200 million invested, supports the development of digital enterprises and attracts young talent. A pleasant and satisfying style of life in the heart of Europe: Situated in the very heart of Europe, France is the world’s top tourist destination in terms of number of foreign visitors (OMT, 2014). For the third consecutive year, Paris has been named the world’s best city for students (QS Best Student Cities, 2014). France ranks third in the world in the responsiveness of its health services to the needs of the population (IMD, 2014). The art of living “à la française”: More than 40,000 monuments and protected sites, 39 cultural sites appearing on UNESCO’s world heritage list, 8,000 museums, 2,000 cinemas, and more than 500 festivals attest to the richness of French cultural life. French artists are influential in every creative field. With 15 winners, France is home to the largest number of laureates of the Nobel prize in literature (Patrick Modiano won in 2014). French, an international language: Spoken on all five continents and the official language of many states and international organizations, French is the world’s fifth most widely used language, with 274 million speakers. After English, French is the most widely studied language in the world. It is the world’s third most common business language and second most common language of international news (OIF, 2014). An appealing destination for international students: With more than 295,000 international students at the post-secondary level (MENESR, 2014), France trails only the United States and the United Kingdom (UNESCO, 2012). 80% of those who study in France report being satisfied with the quality of education and the value of their French degree. 9 out of 10 international students hold a positive view of their time in France and recommend France as a study destination (Baromètre Campus France, 2013). Campus France is a French public institution in charge of promoting higher studies in France and facilitating the international mobility of students, researchers, and experts. It has 190 offices in more than 110 countries. 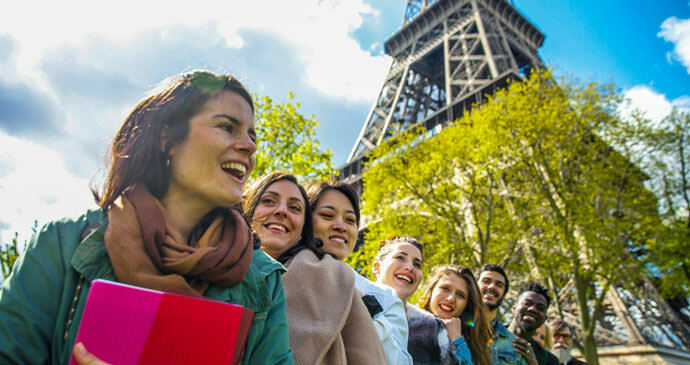 Campus France provides students with guidance at every step of their higher education project in France, including information about available programs, scholarship opportunities, visa application process, and housing options. Visit Campus France website here (French) or here (English). Head over to the Campus France Bangladesh Facebook page here.